Welsh band Mabon have won the prestigious "Best Instrumental Album of 2010" title in the 2011 Spiral Awards. The Welsh sextet, (famed for their vibrant fusion of “InterCeltic” music), scooped the coveted award with their debut live album, "Live at the Grand Pavilion". The album was recorded with the original Mabon line-up (including Derek Smith - Jamie's dad - who has now been replaced by Adam Rhodes) as opposed to the newly launched and re-named "Jamie Smith's Mabon". Mabon polled an impressive 43% of the vote in the awards run by the popular music web site, Spiral Earth, giving them a resounding win in the category also contested by top performers Andy Cutting, Dave Swarbrick, Catriona McKay & Chris Stout and Matheu Watson. "Live at the Grand Pavilion" was recorded in Wales on the final atmospheric “homecoming” night of their buoyant 'OK UK' tour, in Porthcawl in autumn 2009 and released in 2010. Jamie Smith led a line-up comprising Ruth Angell on fiddle, Calum Stewart on flute/pipes, Derek Smith on guitar, Matt Downer on bass and Iolo Whelan on drums and percussion. The dynamic album captures all the energy and pizzazz of their acclaimed live show and is accompanied by a free bonus DVD filmed on the same tour at the Quay Arts Centre on the Isle of Wight – making a complete 107 minute value package. The album not only triggered an instant response from fans old and new but garnered an unprecedented volume of media airplay and reviews for the band, including BBC Radio 2 and 3. 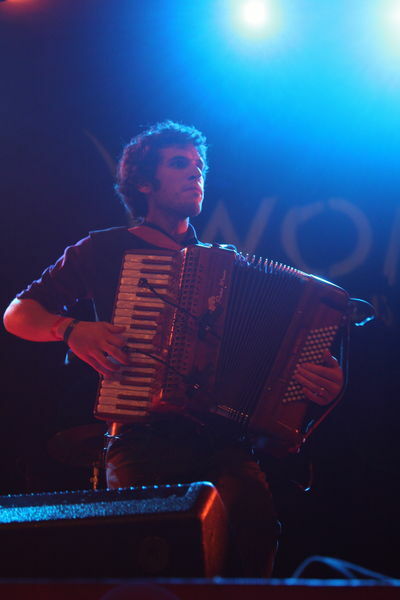 Radio 2’s Mike Harding called them “a top band led by one hell of an accordion player and arranger” while Radio 3’s Mary Ann Kennedy described them as “a breath of fresh air in Welsh music” and the Financial Times praised their “fearsome reputation as a live band”. Smith’s inspired, eclectic tunes dominate the material that delves into every Celtic corner – from their native Wales to Brittany, Scotland, Ireland, Galicia and beyond. The South Wales-based musician’s prolific and imaginative compositions take audiences on a magical whistle-stop Euro tour with jigs and reels jostling for space alongside other dance-related forms including Breton an dro, French mazurka, Galician muinera and even shades of klezmer in an exuberant, feelgood show. Mabon relaunched as Jamie Smith’s Mabon (JSM) at the start of 2011. While Mabon (meaning autumn equinox) gained its class act reputation as an instrumental band, JSM will be making a new departure by weaving some songs, penned by Smith, into the set – as part of some exciting shifts in style and sound. The new-look Jamie Smith’s Mabon saw the arrival of band member Adam Rhodes. Edinburgh-based Rhodes (29), raised on the Isle of Man, brings a bouzouki to the band’s soundscape for the first time. The remaining band members are all familiar faces from the former Mabon line up – Brittany-based Young Scottish Musician of the Year finalist Calum Stewart on wooden flute and pipes ; stand-out, in-demand fiddler Oli Wilson-Dickson, Cardiff’s Matt “The Hat” Downer on bass and the Vale of Glamorgan’s irrepressible Iolo Whelan on drums and percussion. Ruth Angell, who appeared on the winning album, will continue to stand in when Wilson-Dickson is unavailable. The new band has already scored success in Scotland notching up a successful debut at the world’s largest indoor music festival this month –Celtic Connections - while they have lined up several UK festival performances this summer, including headlining Fylde Folk Festival in September. 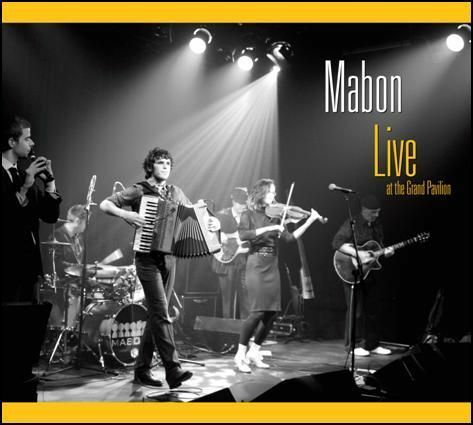 Mabon won over festival and theatre audiences across Europe with their frenetic and finely brewed blend of InterCeltic music and rabble rousing funk folk. They played castles in Poland, forest parks in Italy and conjured their magic in Mexico with audiences warming to their consummate musicianship and multi-layered show. 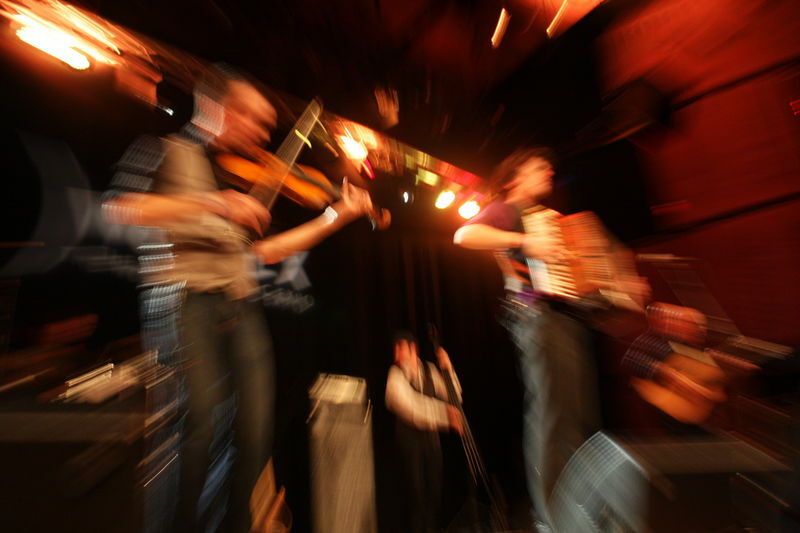 In autumn 2010 Mabon were chosen for a prestigious performance at the First Minister of Wales’s Ryder Cup dinner at Cardiff Castle and the Welsh Music Foundation selected them as a showcase act at the WOMEX world music trade fair in Copenhagen. In addition, BBC Radio 3 presenter Mary Ann Kennedy picked Mabon to appear on a box set CD “Beginner’s Guide to Celtic” featuring some of the finest Celtic acts in Britain today. Their eventful year also included a somewhat unorthodox debut at Fairport’s famous Cropredy festival in Oxfordshire in front of 20,000 people. Despite a Friday 13th jinx which left half the band stranded on the Welsh side of the Severn Bridge when their vehicle’s engine blew up (!) - they became one of the highest CD selling artists at the event. Jamie and Oli entertained the crowd as a duo for most of the set with the full line-up only on stage for the final two numbers, their late arrival triggering a huge cheer from the crowd! After gigs in France this spring, Jamie Smith’s Mabon will head back to the UK for appearances at Bristol, Chester, Southwell, Priddy and Fylde Festivals and, back on home ground, Cardiff’s “Roots Unearthed” concert series at St David’s Hall. JSM’s brand new website - in Welsh, English and French - can be found at www.jamiesmithsmabon.com where the winning album and back catalogue can also be purchased.